Biggleswade start their league campaign in Midlands 3 East (South) on Saturday with a trip to neighbours St Neots. A good first result is what is needed from the Biggy Boys following last year’s disastrous campaign that saw a long losing run ending in relegation from Midlands 2 East (South). Meanwhile St Neots won just five of their games last season and finished bottom of the table – however a reorganisation of the league structure saw them remain at the same level. But Biggy should expect a tough game as St Neots are never easy to beat on their home turf. In their final warm up game at the weekend Biggleswade did everything right for the first 50 minutes but faded in the last quarter, losing 29-17 to Ampthill Extras. 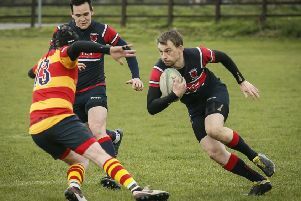 The older, more experienced outfit took advantage to run in some easy tries to run out victors. Club Captain Dom Nott looked on from the sidelines, as he will have to all season due to injury, and reported that many aspects of Biggleswade’s game looked good. Two men who earned special praise from the skipper were newcomers Paul in the second row and Tom on the wing. But it was the old hands who scored Biggleswade’s points. Michael Hall, who is approaching a century of games for the first XV, crossed the line for one try and an unknown forward was at the bottom of the pile after a forward catch and drive. George Tiley, making his first team debut, scored the third five-pointer. Scrum-half Luke Haverley added two points with a conversion. St Neots are gathering a larger crowd than usual on Saturday so have organised a VP Lunch on Saturday to intimidate the visitors. The Development XV is at home to Hendon in their first league match while the Thirds travel the short distance to play Letchworth 4th XV. Both matches kick off at 3pm.